The Black-collared Lovebird (Agapornis swinderniana) - also referred to as Swindern's Lovebird - is a rare lovebird species that was discovered by Heinrich Kuhl in 1820. Its name commemorates the Dutch professor, Theodore van Swinderen, of Groningen University. 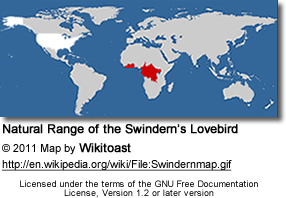 The Black-collared Lovebirds are distributed across a wide range in equatorial Africa. Specifically, they occur in the forests of Cameroon, Central African Republic, the Republic of Congo, the Democratic Republic of Congo, Côte d'Ivoire, Equatorial Guinea, Gabon, Ghana, Liberia and Uganda. These shy birds typically hide high in the forest canopy and are difficult to spot. These small lovebirds typically measure 13 - 13.5 cm in length (~5 in) long (including tail) and weight between 39 - 41 grams (1.8 - 1.5 oz). The plumage is mostly green, slightly paler on the head and upper body and back. Its most distinctive marking is the characteristic black half collar at the nape (back of the neck). The chest is orange or olive-yellow, merging into yellow on the belly. The rump has bright blue and red markings. They have blue upper tail feathers and the root of tail is red. The feet, legs and beak are grey to black, the beak is black, and the irises are yellow. Males and females are similarly marked. Immatures: The plumage of juveniles is generally paler. They either lack the black band to the nape (back of the neck) or it is very faint. The bill is pale grey with a blackish base and the irises are brown. ID and Additional Info: The yellow area below the half collar at the nape is extended and is orange. 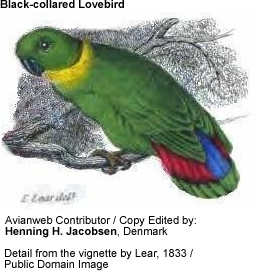 It is also somewhat larger than the nominate species and has a slightly brighter green plumage. This particular species was successfully kept by a missionary named Father Hutsebour, who kept them alive on a diet consisting of sycamore figs. Attempts to maintain them with a different diet failed and these birds died within a few days. This species has never been successfully exported. 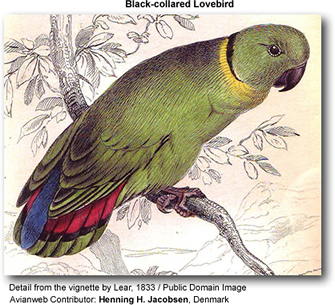 The Black-collared Lovebird is relatively unknown in Europe, Americas and other countries as its dietary requirement for native figs have been blamed for the lack of success in keeping this species in captivity. Without certain native (fresh) fig seed, fig flesh and rice as a base diet, these lovebirds died within days leading many to believe that this species cannot be adapted to life in captivity. Although there are some unverified reports of successfully maintaining some as pets and even breeding several color mutations - none have been confirmed. 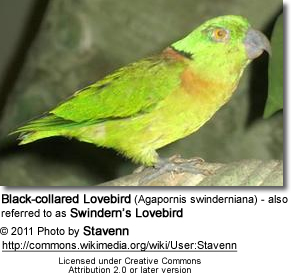 Black-collared lovebirds are not readily available in aviculture and little is known about their pet potential. Should captive birds be available, every effort should be made to place them into a well-managed breeding program to conserve this species for future generations. Lovebirds, in general, are pretty easy to manage for most people. They are not as destructive and noisy as their larger cousins. If not properly socialized, however, they will discover their beaks as method of "disciplining us". Breeder Listing by State / Country. The female constructs the nests; and she incubates the three to six eggs for about twenty-three days. She raises the hatchlings until they leave the nest when they are about six weeks old. At this point, the father takes over the feeding of the fledglings for another two weeks or so until they are weaned and independent. Note: Captive breeding of this species is complex and should be handled by the most experienced aviculturist.